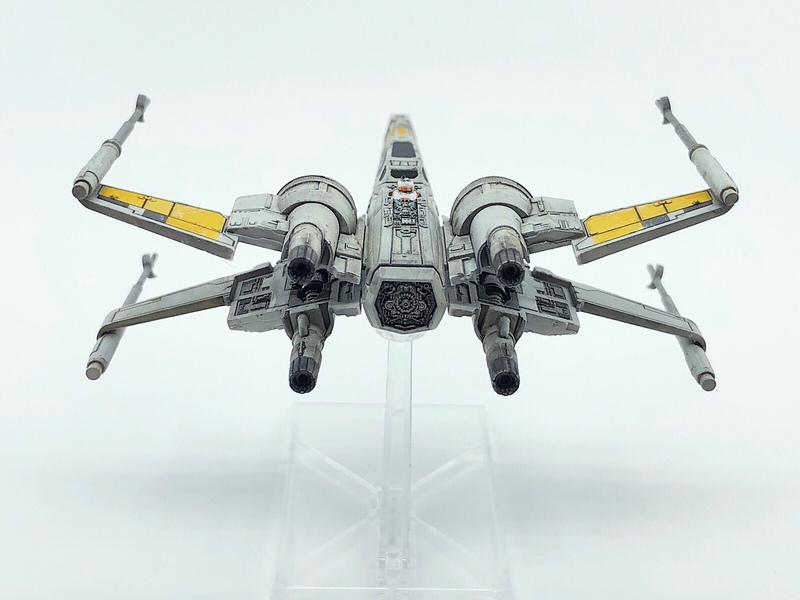 This model is part of a Last Jedi Resistance Vehicles boxed set that includes Poe Dameron’s boosted X-Wing, a Blue Squadron T-70 X-Wing and a 1/350 scale Millenium Falcon. 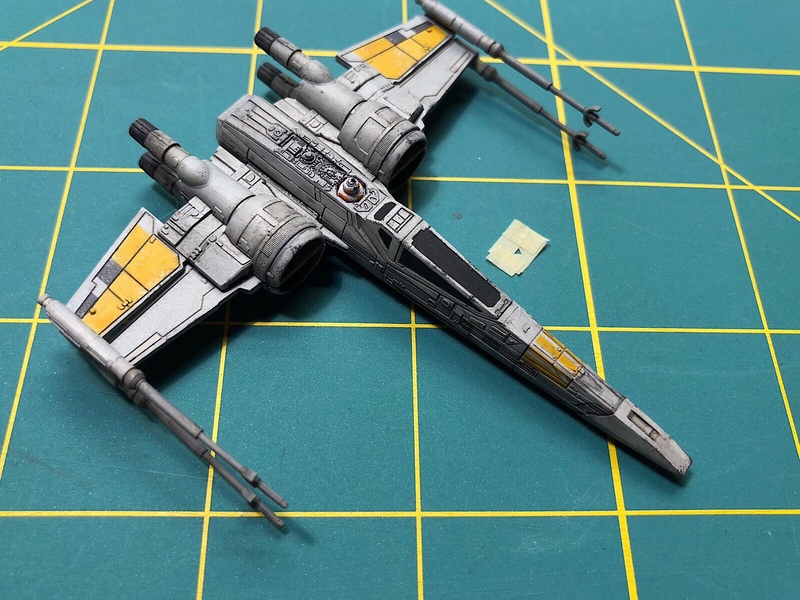 Rather than going for the standard Blue Squadron paint job, I wanted to try to something a little different. I’ve seen a number of people create builds based on Ralph McQuarrie’s concept art from the 1970s and I really like the color scheme. 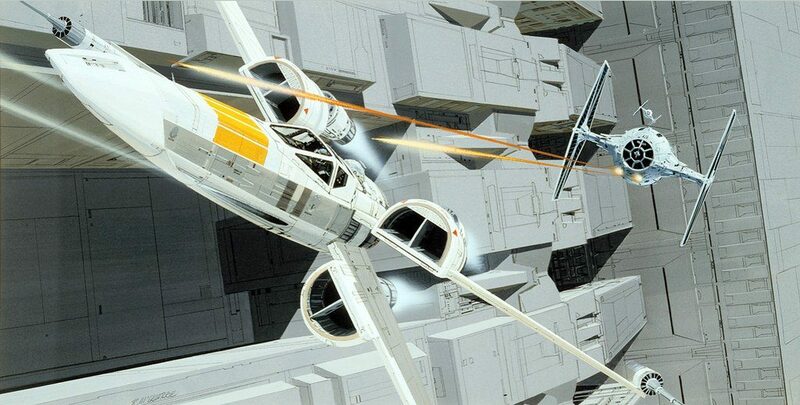 The design team for Episodes VII and VIII went back to a lot of McQuarrie’s original concept art for the “new” ships as you can see from the half-cylinder engines in the X-Wing image below. 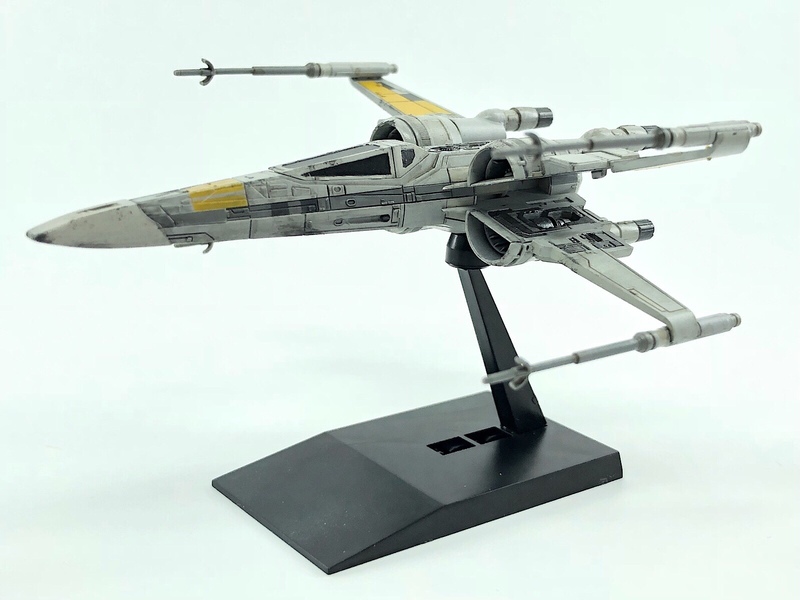 One of my favorite modelers, AndyRM101 over at Britmodeller.com, did a fantastic job with the 1/72 scale version for his Resistance T-70 X-Wing model and I’m hoping to do something similar at a smaller scale. As with the other Bandai Star Wars kits, the quality and detail of the parts are exceptionally good. However, this kit was unusual in that the halves of the thrusters did not perfectly match up when assembled. Bandai usually has exceptionally good fit for their parts but I had to trim down the assembly tabs to manually align the parts for a perfect fit. They were only misaligned by a fraction of a millimeter, but on a model this small, the mismatch is more prominent. Another minor issue is the central shaft that the S-foils rotate around was too loose and it’s too easy to nudge the S-foils out of their X configuration. 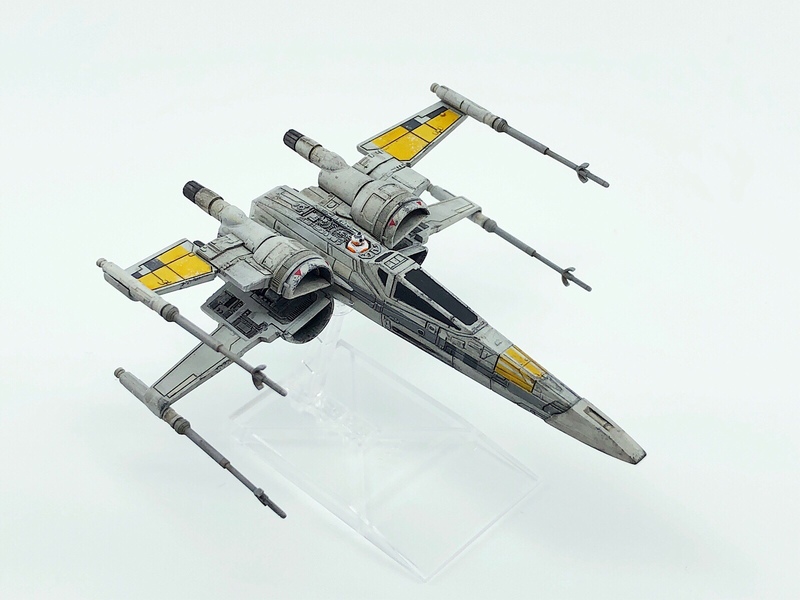 I found this to be the case on the T-65 X-Wing model as well. I ended up adding some glue around the central shaft to bulk it up slightly and tighten up the fit. 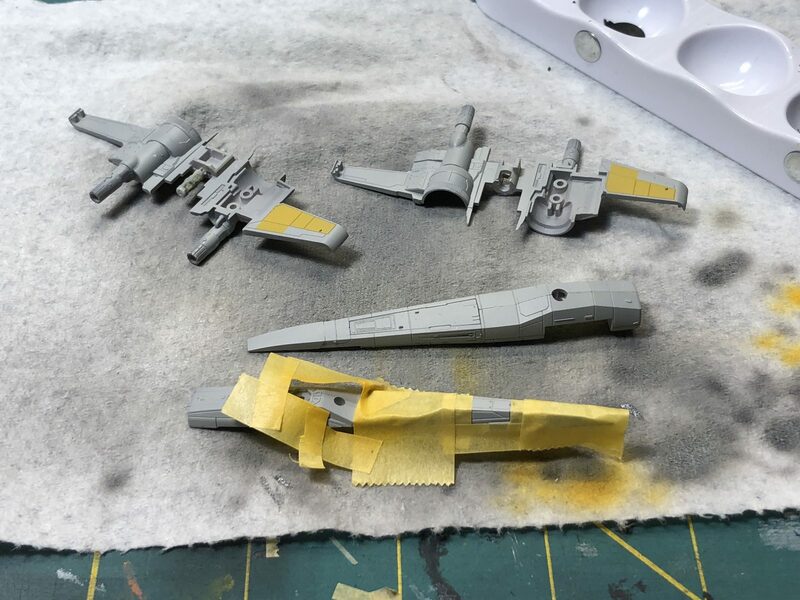 I applied a base coat of Stynylrez Gray Primer followed by a coat of Vallejo Model Air 71.121 Light Gull Gray which turned out to be a little too dark. 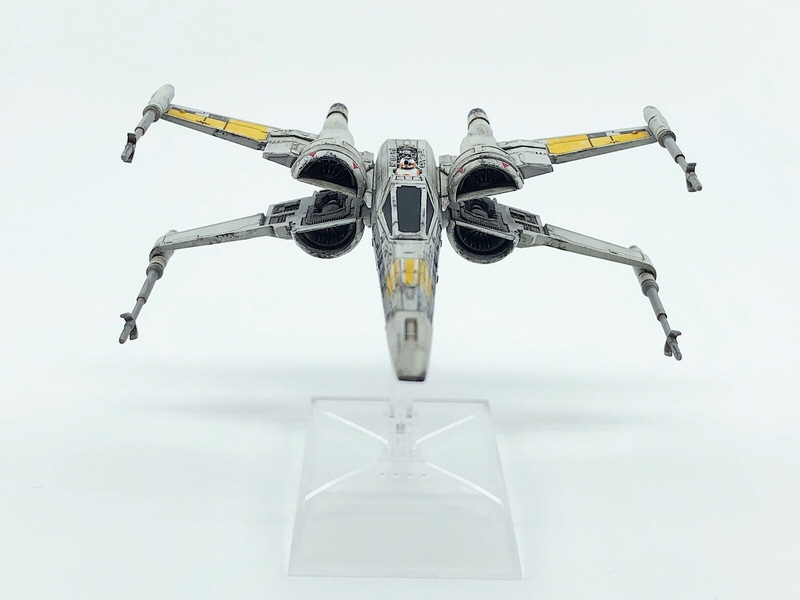 The orange-yellow hull and wing markings were masked and airbrushed on with Minitaire D6-125 Warning Yellow. 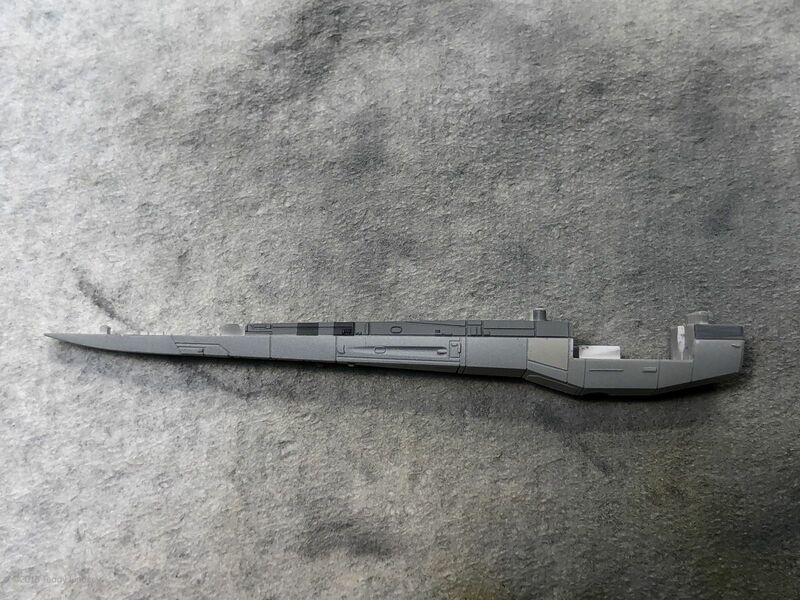 I used Minitaire D6-109 Badger Fur for the gray hull stripe and Minitaire D6-110 Charred Stone for the darker blocks. Metal panel details were a thin mix of Vallejo Game Color 72.054 Gun Metal and Model Air 71.057 Black. Some panels were painted with Minitaire D6-108 Rock which has a lighter, warmer tone than Badger Fur. 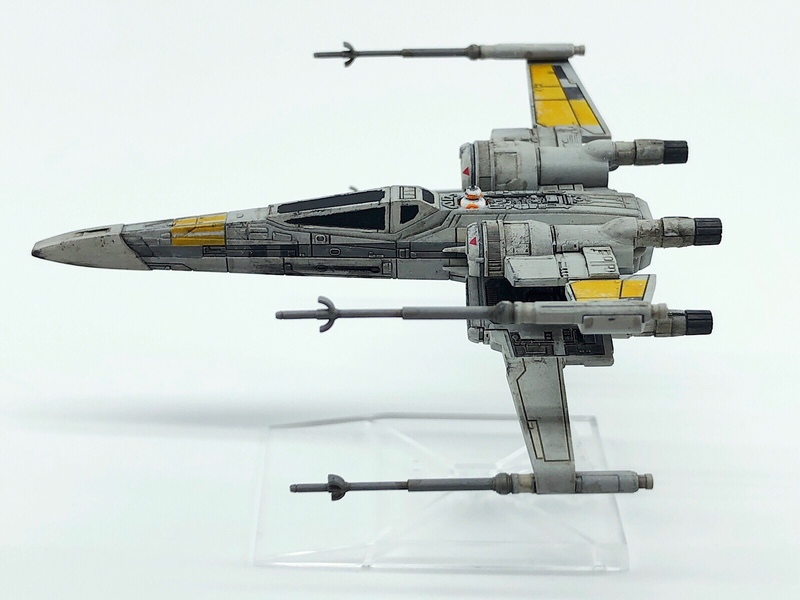 Like most X-Wings, there are quite a few markings and panels that need to be masked. I copied the wing markings from AndyRM101 which used a combination the orange along with smaller dark gray blocks on the wings to give a little more visual interest. 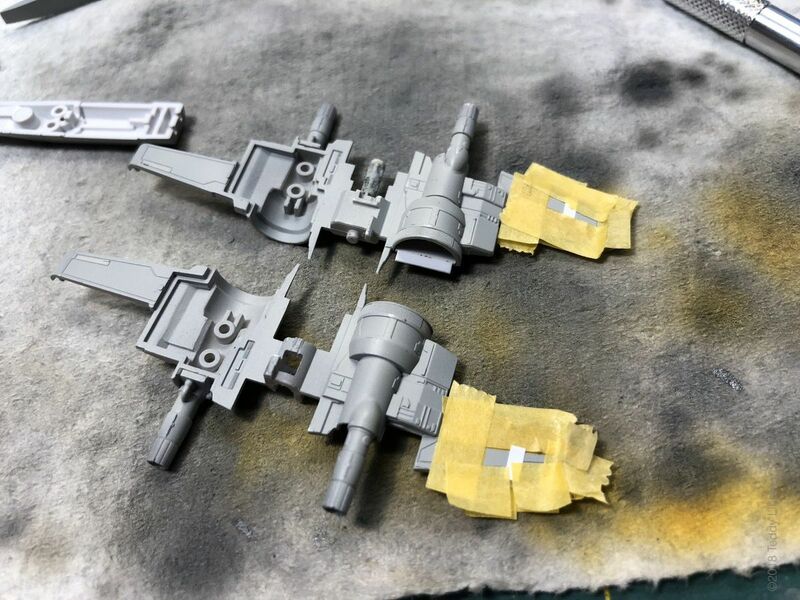 After blocking in all the base colors, I sprayed on a coat of Tamiya TS-13 Clear so I could begin weathering. 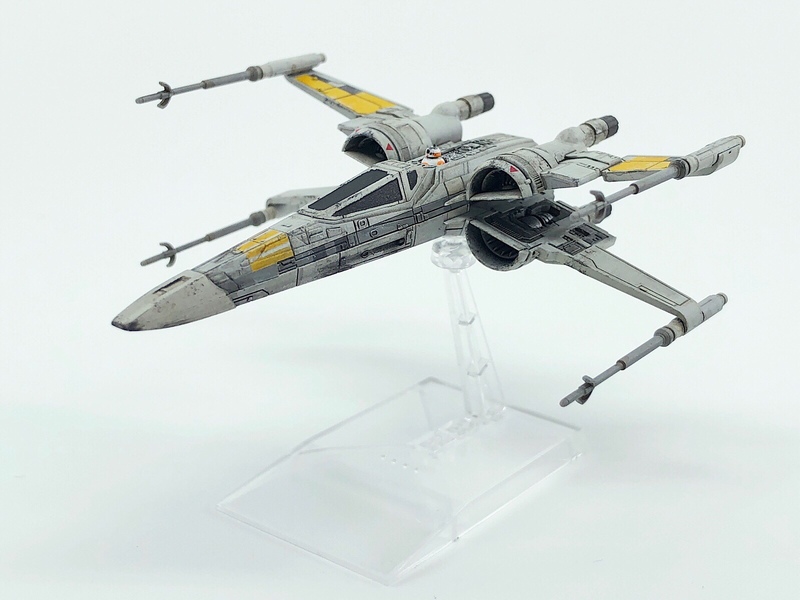 Since other builds of the “McQuarrie X-Wing” I’ve seen were painted in a clean style like the original concept painting, I wanted to weather mine a bit to look closer to the grungy style of the movies. 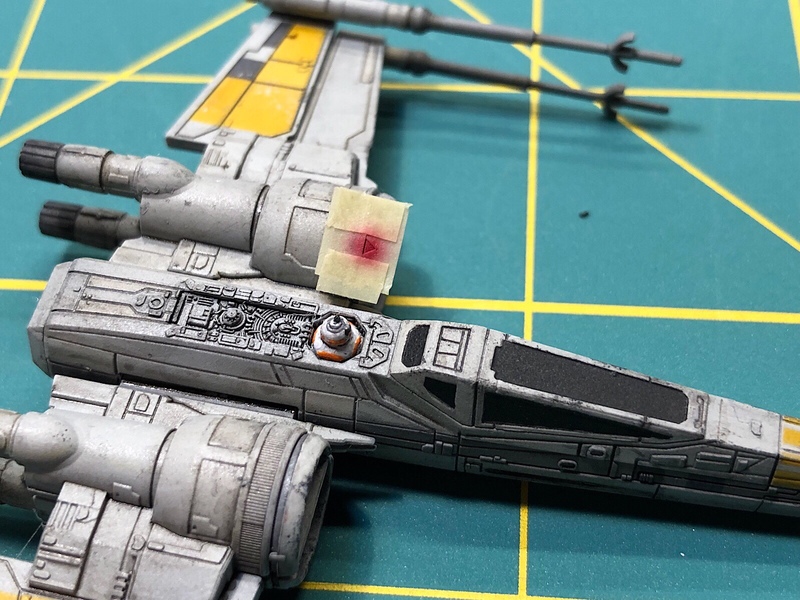 Due to the tiny size of the model I avoided the use of chipping fluid or liquid mask for the wear marks on the markings and instead sponged on small spots of Deck Tan using a torn bit of makeup sponge. 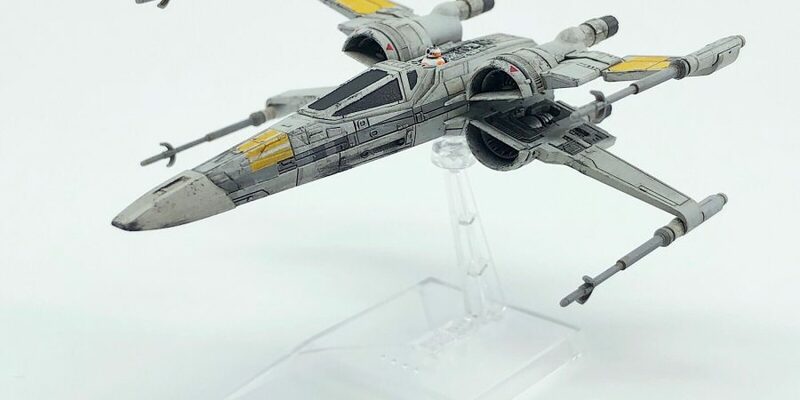 Since the orange hull markings are pretty light, the chipping is not very prominent. I also sponged on darker scuffs and streaks with Model Air 71.268 German Gray. I’m eagerly awaiting a shipment of Flory Washes which I understand to be excellent. In the interim, I used Vallejo Model Wash Light Gray, Dark Gray and Rust in various mixtures for picking out panels lines and details. 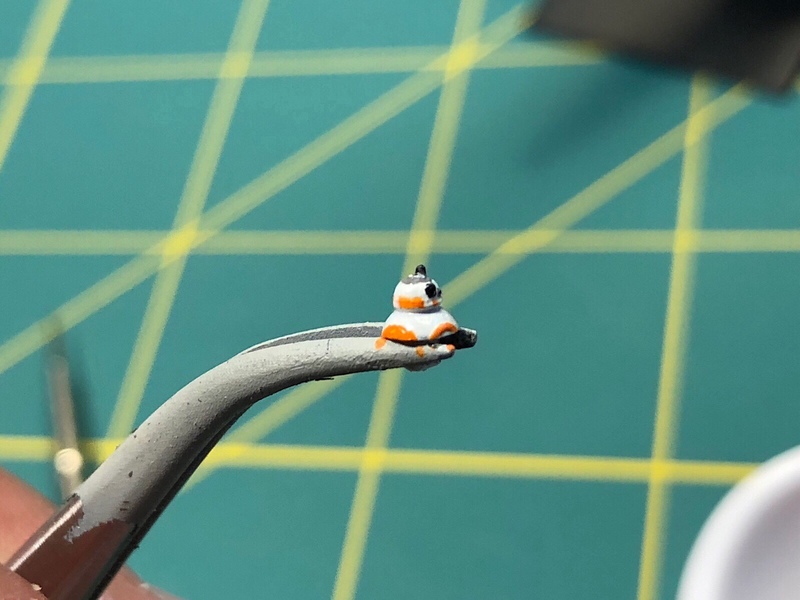 The BB model droid is a tiny little piece of plastic which has surprising detail for being so small. It was tricky to paint and required quite a bit of time to sharpen up the details. Below is the initial color blocking before cleanup and a pin wash.
Another tiny detail were the red triangles near the leading edge of each engine intake. I didn’t have any decals so small, so I made a little mask and airbrushed on Model Air 72.711 Gory Red and it turned out great. I should have gone for a lighter hull color like Vallejo White Gray, but I didn’t have any on hand and I wanted to try out my Minitaire paints. Overall, this was a fun little build and I’m slowly building up a fleet of 1/144 Star Wars vehicles from Bandai. Now I just have to find the time to build and paint them!